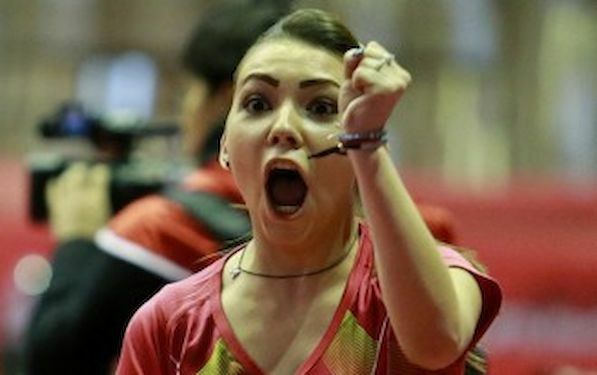 Bernadette SZOCS of Romania and Benjamin BROSSIER of France clinched the titles at their respective Women’s U 21 and Men’s U 21 Singles Event at the GAC Group 2015 ITTF World Tour, Qatar Open (Super) in Doha. In the final of the Women’s event SZOCS beat LIN Ye of Singapore. Previously, SZOCS overcame ZHOU Yihan also of Singapore, whilst in quarterfinal young Romania star succeeded against top seeded DOO Hoi Kem of Hong Kong. Lea RAKOVAC of Croatia also reached quarterfinal, before she lost against LIN Ye. BROSSIER overcame HO Kwan Kit of Hong Kong in the final. At the penultimate stage he beat WANG Yang of Slovakia. In the main Men’s Event Portugal’s João MONTEIRO and Slovenia’s Bojan TOKIC were the players to cause the upsets in the lower half of the draw in the first round. João MONTEIRO overcame Korea’s KIM Minseok, the no.9 seed (12-10, 5-11, 11-8, 12-10, 11-7); Bojan Tokic ended the hopes of Nigeria’s Quadri ARUNA, the no.13 seed (11-2, 11-8, 15-13, 7-11, 11-4). Austria’s Daniel Habesohn was the one player to upset the seeding as matters progressed in the top half of the draw.Daniel HABESOHN accounted for Frenchman Simon GAUZY, the no.15 seed (3-11, 12-10, 7-11, 11-9, 13-11, 12-10). Germany’s Dimitrij OVTCHAROV, the top seed, beat Russia’s Kirill SKACHKOV (11-6, 11-5, 11-9, 11-7), Portugal’s Marcos FREITAS, the no.3 seed, overcame Korea’s LEE Sangsu (13-11, 6-11, 11-4, 11-8, 11-7). Ukraine’s Tetyana BILENKO and Spain’s SHEN Yanfei were the players to cause the upsets in the first round of the Women’s Singles event. Tetyana BILENKO proved far too solid against Chinese Taipei’s CHENG I-Ching, the no.14 seed. SHEN Yanfei overcame Hungary’s Georgina POTA, the no.5 seed, in six games (6-11, 5-11, 11-8, 11-6, 15-13, 11-8).